Yogyakarta is a city of memories for some people. Once you visit here, you might miss to come back. Not only a tourist city, Yogyakarta is a magnet for both local and foreign tourists. The combination of cultural elements and stunning natural scenery, makes millions of people from all corners of Indonesia and even the world want to visit it. If you arrive in Yogyakarta at night, make sure not to waste your time to rush to bed at the hotel. That’s because Yogyakarta never sleeps at night. Yogyakarta still offes many stunning nightlife. Here are the best nightlife in Yogyakarta that you will never find during the day. One thing you must do when visiting Jogja is taking some pictures in Tugu Jogja. Tugu Jogja which is painted white with gold sheets looks great at the intersection of Jl. AM. Sangaji, Jalan Diponegoro, Jalan Sudirman, and Jalan Margo Utomo (P. Mangkubumi). Tugu Jogja is on the line between Mount Merapi and the Palace, making it the heart of a special city. If you consider Tugu Jogja to be ordinary, wait until nightfall. 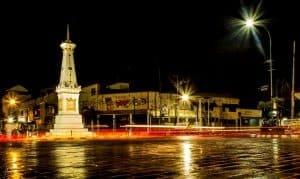 Decorated with city lights, Tugu Jogja looks so charming. It is so fascinated, that is why many people were willing to wait until the streets were rather quiet for taking pictures with Tugu Jogja at night. You certainly know that the Zero Kilometer or KM Nol area is having a number of Dutch heritage buildings called loji. You must try to come here at night, as if you were invited to travel to the past through old buildings that are maintained until now. The yellowish glow of mercury lamps adds a romantic impression to this place. The KM Zero area is a favorite place for youths in Jogja to hang out or express themselves with their community. You can see various communities and artists attracting visitors’ attention through their attractions. Some of them imitated bronze statues, dressed up as ghosts, and danced. From the Zero Kilometer point, you can walk to the south and find the north square (Alun-Alun Utara) of Yogyakarta. 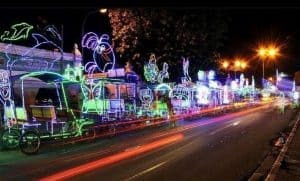 Every year before the commemoration of the Birthday of the Prophet Muhammad, the northern square is one of the centers of joy in Jogja at night. This is where the Sekaten night market is held every year. You can find a variety of fun and cheap games, such as kora-kora, Ferris wheel, Banyu waves, and ghost houses. There are also various snacks and shops that sell used clothing. The atmosphere was more boisterous with the playing of dangdut songs on a number of rides. 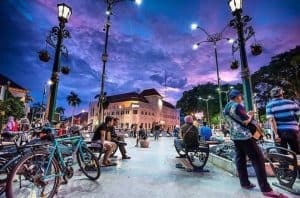 Malioboro, the most legendary road segment in Yogyakarta is apparently not only lively with the tumultuous inter-human interaction during the day. When night falls and the city lights start to light up, Malioboro will show his beautiful face. This view is one reason many people find it hard to move on from Jogja. On the left and right, you can enjoy the views of old buildings that combine with malls and hotels on foot. Don’t forget to stop to enjoy the unique angklung music from the usual angklung singers “performing” on the sidewalk of Malioboro. In addition, you can also enjoy a variety of culinary items that you might not get during the day. Jogja Kembali Monument or Monjali is a monument and museum history of the struggle for independence of the Republic of Indonesia which is located on the North Ring Road of Yogyakarta. In addition to containing historical records to commemorate the hero of independence, this monument turned out to have its own romantic side at night, you know. In the courtyard of Monjali, there is a Rainbow Park that feels vibrant and romantic at night. 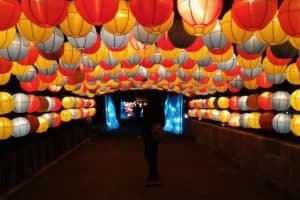 Lanterns of various shapes illuminate this place with colorful light. Only here you can see the rainbow at night. Moreover, this park is fulfilled with various women that you can enjoy with friends, girlfriends, or family. Don’t forget to prepare a camera for good photos with them. It is not only Bangkok and Bali that have cabaret shows displayed by lady boys or transvestites, Jogja also has. Just visit Oyot Godhong Cabaret Show that shows every Saturday and Sunday night on the roof of Mirota Batik, Malioboro. Here, you will be presented with dancing and lipsync singing performances on the stage sparkling by the transvestites. On this stage the transvestites can be recognized through their ability to entertain the audience. Get ready just to be amused to laugh out loud because of their hilarious style. If you want to watch, don’t be late to the theater, because the place will definitely be crowded. 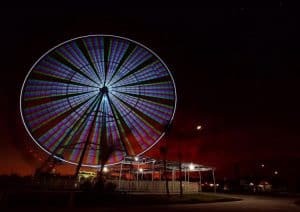 A Ferris wheel with colorful lights in Sindu Kusuma Edupark adds to the glory of Jogja at night. Sindu Kusuma Edupark or SKE is a fairly new recreational park in Yogyakarta. The main vehicle is the 48 meter Ferris wheel alias Ferris wheel. 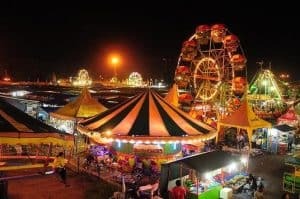 From the peak of the Ferris wheel you can enjoy the atmosphere of the city lights of Jogja with the people you love. This recreational park is only open until 9 PM, so don’t go late. Of course you can only enjoy this thing at night in Yogyakarta. You just need to pay IDR 80.000 – 100,000 for entrance ticket of Sindu Kusuma Edupark. Don’t worry because you can still enjoy other rides there. Bukit Bintang is one of the unique tourist attractions in Yogyakarta. The location is on the Jogja highway – Wonosari, Patuk, Gunung Kidul. This tourism place is actually on the edge of the highway on a hill so that from here the city of Jogja can be seen from a height. 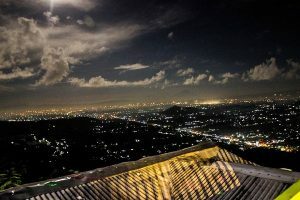 The beauty offered by this star hill is the sparkling charm of the city of Yogyakarta, which of course can only be enjoyed at night. You can come to Bukit Bintang around 7:00 a.m. until after the sun sets completely. 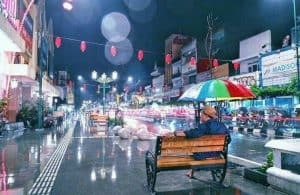 Bukit Bintang, which is on Jalan Raya Yogyakarta-Wonosari, is one of the most charming stops to spend the night. There lined up a number of food stalls on the brink that offers a variety of foods at light prices. 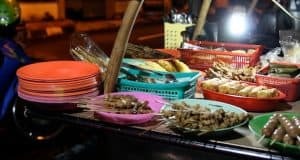 From a height of 150 meters, you can enjoy grilled corn plus warm drinks accompanied by flickering lights of the charming city of Jogja in the distance. It must be romantic, especially if accompanied by someone you love. Enjoying the night atmosphere in Jogja is certainly not complete without a dinner at the restaurant accompanied by a cup of coffee. Every night, Lik Man angkringan on the north side of Tugu Station and angkringan KR on Jalan Margo Utomo is always packed with young people. Shabby simple mats became their seat when they chatted while sipping coffee that was still steamy. You can also order kopi jos (unique coffee brewed with hot charcoal) This atmosphere inspired many musicians to create timeless songs, such as Kahitna with his Yogyakarta song. While you are in Jogja, why not try it yourself? Ramayana Ballet is a venue for drama and dance arts that elevates the Ramayana story. It is usually held every Tuesday, Thursday, and Saturday. 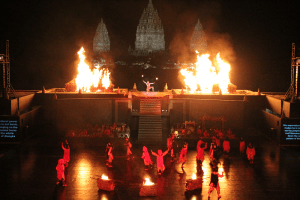 The performance took place from 19.30 to 21.30 WIB which was located in the Prambanan Temple area. In the dry season, shows are usually held outdoors at the Open Air Theater with Prambanan Temple background. In the rainy season, shows are usually held indoor at the Tri Murti Theater. Here you can take part in the Ramayana performance consisting of gabunganseni dance and a typical Yogyakarta theater. Be sure to invite your friends, family, or partner here so that the atmosphere is more complete. The south square or better known as the Alun-Alun Kidul or alkid is also mandatory when you arrive at night. Various colorful lights from ornamental vehicles add to the vibrant place. You can use these decorative cars to get around Alkid at a rate of 30-40 thousand after being offered. Don’t miss also to try your luck through the gap of two Alkid Banyan trees. That said, who can get through the gap between the Banyan trees with their eyes closed, his hopes will come true. So, if you have some hidden hopes, why don’t you just try it? Gabusan Art Market (PSG) is located on Jl. Parangtritis Km 9, Bantul, Yogyakarta. 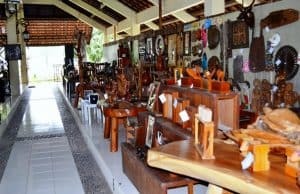 This market with a unique architecture was built with the aim of marketing a number of Bantul community handicraft products. In Indonesia, the Gabusan Art Market (PSG) is the largest art market with a variety of items of an Art nature. Besides that, PSG is also often used for various events, one of which is Bantul Expo. Like skates, Bantul Expo is crowded with visitors at night. Here, you can find souvenirs to take home. Don’t forget to buy Bakpia patuk, a delicious Yogyakarta snack. All in all, Yogyakarta is a stunning city that might fit to make your day. In every inch of this city has a special side that you might have never found before. So, make sure to bring your camera to capture every moment you have in Yogyakarta.